Statement by Solidarity TDs (members of parliament in Ireland) and Socialist Party (Ireland) members, Ruth Coppinger, Paul Murphy, and Mick Barry. The dramatic and clear-cut “Yes” in the referendum is a political earthquake and turning point for Ireland. It is a huge victory, particularly for women in Ireland, who have thrown off the oppression of the 8th Amendment after 35 years. No delay can now be justified. There is nothing to stop the Dail [Irish parliament] to move quickly to enact legislation to give effect to the proposals from the Oireachtas Committee. No more people should suffer. This is also a victory delivered primarily by young people, the generation often disparaged as “snowflakes.” They were the ones who said enough was enough and made this an issue, particularly after the tragic and unnecessary death of Savita Halappanavar [Savita Halappanavar died of sepsis in 2012 after being denied an abortion during a protracted miscarriage]. It was young women who refused to go along with the hypocrisy of the “Irish solution to an Irish problem” and demanded and organised to force this change on a petrified and reluctant political establishment. There was a broad official “Yes” campaign, and then within that, there was an independent grassroots movement that unfolded over the last years, months and weeks. It was this movement that made the decisive difference, including answering the outrageous scaremongering and lies of the No side. There is a huge difference between some who voted “No” and then the organizers of the “No” campaign. The “No” campaign gave a frightening glimpse of the type of Ireland the self-styled religious right would like us all to live under. Dripping in misogyny, the no campaign spread suspicion about women and portrayed them as selfish killers and murderers. Their shaming and blaming of women from the start to the finish is completely unacceptable and devoid of morals. As TDs [members of the Irish parliament] for Solidarity and long-standing members of the Socialist Party [Irish section of the CWI], we have a long record on these issues and fighting for the right to choose. 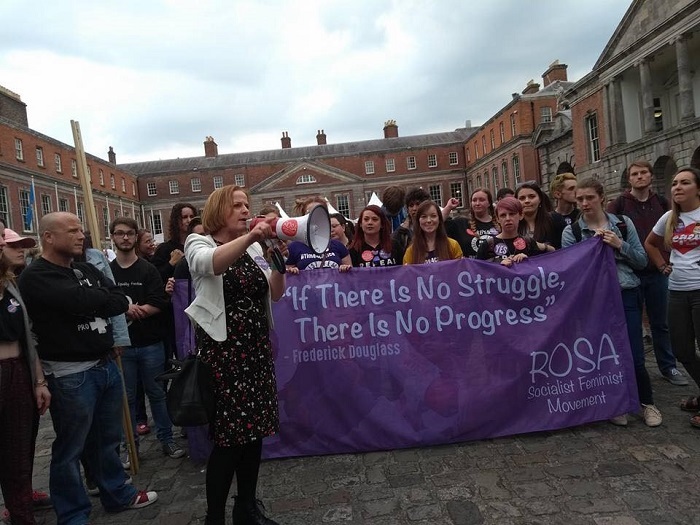 We are proud to have been part of ROSA’s Time4Choice campaign which brought a real cutting edge to the “Yes” side in the referendum campaign and facilitated the development of the grassroots movement. This movement and ROSA are not going to go away, and aim to become a major socialist feminist force fighting for a radical transformation of this country.